I want to defend this newest comic book movie in spite of the scathing reviews Green Lantern has been getting. No, I’m not saying this is a good movie, but I would like to give it some support since it is nowhere nearly as bad as everyone is claiming. Giving this movie a chance, I found that even though it has many problems, it felt honest and earnest and was nevertheless entertaining. The Green Lantern is a sort of space-police officer who bears a magic ring that can allow him to create anything he can imagine so long as he has the will power to do so. He eventually discovers that there is an evil in the Universe that threatens Earth and this menace uses fear to harness a similar power. The movie becomes about the battle between Will vs. Fear. It also tries to be about other things like father issues, becoming a responsible person, etc... (every other superhero movie). The biggest problem with the movie is that it seems rushed. All of these themes get hashed together, and neither one is given enough development. You will notice that so many scenes seem to have been cut. Yes, a lot of them are transitional scenes (people going from one place to another, or escaping something), but without these missing pieces, the arrival into the following scene is jarring and unsettling. This also caused stylistic problems, wherein the audience is forced around from an action scene straight into a quiet moment without being eased into it. That being said, if you can look past the disjointed storytelling, and just give in to suspended disbelief, there is a lot to entertain you. The elements of the story itself (the lore of the Green Lantern Universe) are rich and there is plenty of eye-candy. This is an incredibly expensive effects-driven film, and this creates an epic scope (especially since you travel throughout the Universe). There are some simple but effective comedic moments, and some interesting characters here and there (namely one of the villains - Hector Hammond). Summary: There are definitely noticeable problems, and if you don’t like Ryan Reynolds, that’s not gonna to help. But it’s a silly, fun special effects movie that is not as terrible as some would say. I admit I’m glad that I went to see it, and it almost feels like a guilty pleasure. I suspect if they go through with a sequel, it could be a massive hit if they can clean up the sloppy storytelling and dive into more of the Universe with more action. 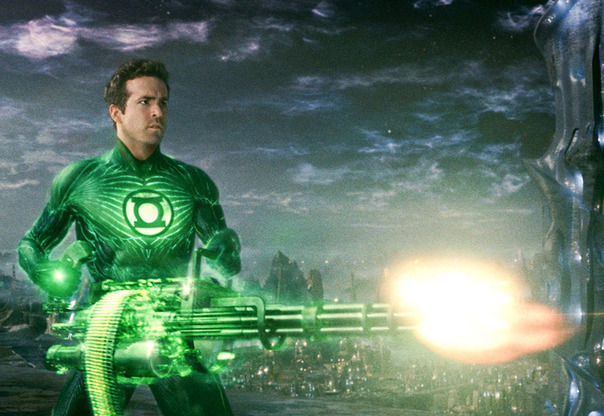 Green Lantern so far gets an ambitious boost up to #752 out of the 1560 films I’ve seen.